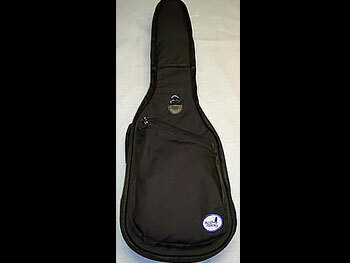 Blue Heron Electric Guitar cases are made with our standard materials. We use dense EVA closed cell foam for the body and sides of the case. The foam is sandwiched between the interior lining of lint-free ripstop nylon and the tough, water-repellent, 1000 denier cordura exterior fabric. We laminate an additional 1/2" pillow of open-cell foam in the peghead area for a shock absorber. Leather protectors are featured in both the peghead area, for sharp string ends, and the strap button area at the inside-bottom of each electric guitar case. For strength, durability, and ease of use, all Blue Heron Cases feature a large #10 nylon coiled zipper with two long-lasting nickel zipper pulls. For carrying convenience there is a padded leather handle. Electric Guitar cases have a handgrip on top of the case, and a grip and pocket on the back. A garment hook is attached to a D-ring and stowed in the pocket allowing the user to hang the case, with or without the instrument, backstage or in a closet. A handgrip makes it possible to hold the case vertically. We call it the elevator grip. The case comes with a detachable 2" strap that can be used as a shoulder sling, or as a single strap backpack carry. This method is both secure and comfortable. Click here to see the shoulder strap carry method. There is a large, zippered, pouch pocket on the top of the case for storage, and for small accessories (picks, cards, etc.) 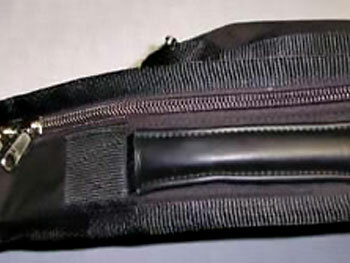 there is a flat pocket inside the neck area of the case. Padded backpack straps are available as an option.